The objective of this post is to explain in more detail certain concepts relating to constraints. In particular I will be looking at thresholds and severity levels and explaining how they work. According to the Oracle Public Sector Budgeting documentation, “Constraints are used to notify users regarding specific conditions for account ranges, elements, or position sets. For example, users can be notified if the total expense for a range of accounts exceeds a particular dollar amount. 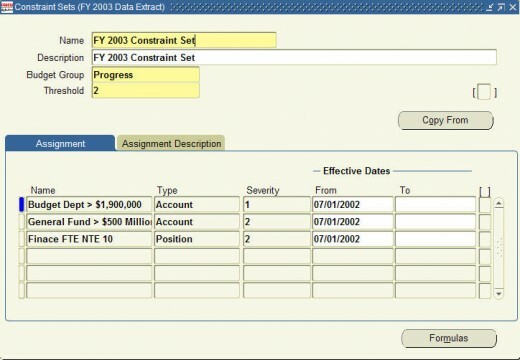 Account constraints are used to prevent budget amount violations for line items. Element constraints are used to prevent modification of element rates for a selected group of positions. Position constraints are used to prevent element cost violations for selected positions or positions that are assigned to invalid element options”. Constraints (otherwise known as ceilings in most of the Government organisations I have implemented in) are used to place limits on budget estimates. In Oracle Public Sector Budgeting, estimates are prepared in budget worksheets and after these estimates are prepared they are checked against constraints or ceilings that have been put in place by the relevant authorities. The screen shot below shows the constraint setup screen in Oracle PSB. One of the concepts I struggled to understand was severity levels and thresholds and how these worked together. I felt that the Oracle documentation was a bit weak in this area and did not clearly define how these two settings worked together. In the next couple of paragraphs I will attempt to clarify how these “parameters” work. This occurs is the threshold is less that or equal to the severity level. In the diagram shown, lines two (“General Fund”) and three (“Finance FTE”) would be classified as hard ceilings. If a ceiling is hard, when a budget worksheet preparer submits a worksheet for review, a constraint violation will be produced and the user will be required to amend the violation to the worksheet and then re-submit it. Essentially, the worksheet will remain stuck with the preparer until such time as he ensures the constraint violation is rectified. This occurs if the threshold > severity level. In the diagram shown, line one (“Budget Dept”) would be classified as a soft ceiling. In this instance, when a budget worksheet preparer submits a worksheet for review a constraint violation will be produced, however, the authoriser will still be able to work on the worksheet and post it to the General Ledger. Essentially, a warning message will be produced that there is a constraint violation but this will not stop the worksheet going through all the remaining processes needed to post it to the General Ledger. Note: If the severity level is left blank then it is assumed to be less than the threshold level.